Griffin also released a limited edition metal skull box set. It is said to be made in 2500 copies but I have never seen a copy with a number over 500 so I wonder. However, in January 2016 a copy of the Iron Fist Iron plaque was sold on Ebay and this had number 724 of 2500! This number plate could be from a Fistful plaque. In April 2010 the seller companysale sold a plaster cast for the skull, described as: "This item is unique in the fact that this was the plaster cast used to manufacture the 'Iron Skull" set that was released back in 1994 / 1995 by Griffin Records. Created by the Chicago artist Bruce Webber and this plaster cast was them used to create the master mould that the "iron" set was cast in iron from. This plaster cast does NOT have the indented back that the CD fits into, but is solid. This plaster cast also does Not come with the CD. The plaster is white and looks to have some kind of finish put on to smooth out the texture. 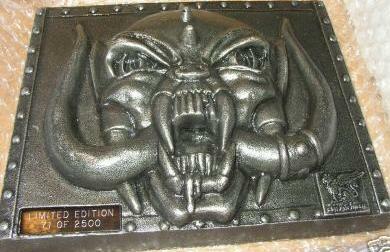 This is sold as a one of a kind collectable item that for a Motorhead fan is a unique piece of the bands history. As you can see from the picture the third (Lowest) spike on the head has been chipped and about 50% of the original spike is missing. This article will be very fragile to ship and that is why shipping is so high".